We all have fond memories of a toy from our younger days. Most of which are still easy enough to get your hands on thanks to eBay or modern reproductions, but what if your childhood fancies weren’t quite as mainstream? What if some of your fondest memories involved playing with 1960’s educational games which are now so rare that they command hundreds of dollars on the second-hand market? That’s the situation [Mike Gardi] found himself in recently. 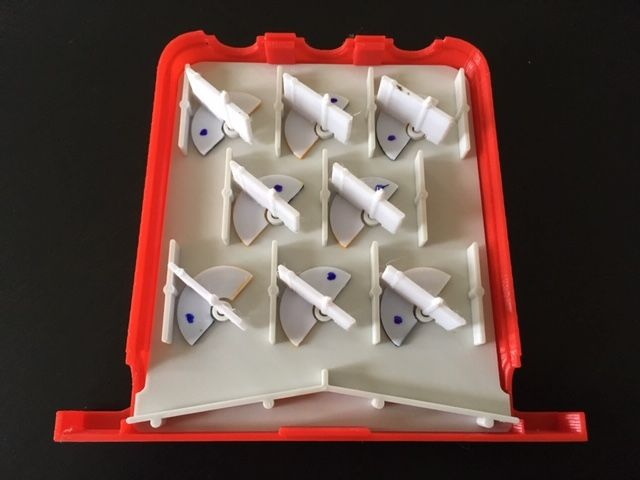 Seeing that the educational games which helped put him on a long and rewarding career in software development are now nearly unobtainable, he decided to try his hand at recreating them on his 3D printer. With his keen eye for detail and personal love of these incredible toys, he’s preserved them in digital form for future generations to enjoy. His replica of “The Amazing Dr. Nim” needed to get scaled-down a bit in order to fit on your average desktop 3D printer bed, but otherwise is a faithful reproduction of the original injection molded plastic computer. The biggest difference is that his smaller version uses 10 mm (3/8 inch) steel ball bearings instead of marbles to actuate the three flip-flops and play the ancient game of Nim. [Mike] has also created a replica of “Think-a-Dot”, another game which makes use of mechanical flip-flops to change the color of eight dots on the front panel. By dropping marbles in the three holes along the top of the game, the player is able to change the color of the dots to create various patterns. The aim of the game is to find the fewest number of marbles required to recreate specific patterns as detailed in the manual. Speaking of which, [Mike] has included scans of the manuals for both games, and says he personally took them to a local shop to have them professionally printed and bound as they would have been when the games were originally sold. As such, the experience of owning one of these classic “computer” games has now been fully digitized and is ready to be called into corporeal form on demand. This is really a fascinating way of preserving physical objects, and we’re interested to see if it catches on with other toys and games which otherwise might be lost to time. As storage capacities get higher and our ability to digitize the world around us improve, we suspect more and more of our physical world will get “backed up” onto the Internet.